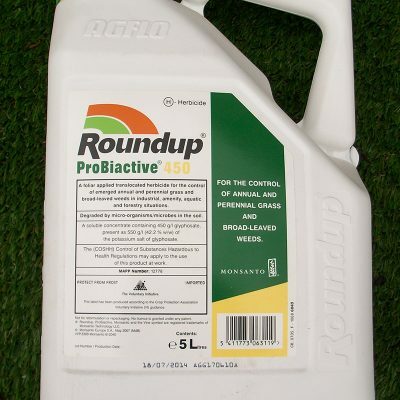 Roundup ProBio 360 is a foliar applied translocated herbicide developed using a new surfactant system containing a unique, patented blend of two surfactants. Roundup ProBio has been developed for use on weeds in hard surfaces, amenity vegetation, enclosed waters, natural surfaces which shouldn’t bear vegetation, as well as land immediately adjacent to aquatic areas and open waters. Roundup ProBio can be rainfast in one hour for annual weeds, and four hours for perennial weeds. Roundup ProBio is an evolution from Roundup Pro Biactive, and is its replacement for superior weed control. ProBio is an upgrade of the familiar, successful and effective biactive formulation, Roundup Pro Biactive 360. If you’ve used Roundup Biactive in the past, ProBio should now be your first choice. Glyphosate, the active ingredient in Roundup ProBio, controls weeds by blocking the plant’s enzyme system. These enzymes, which are present in plants, do not occur in humans, animals, birds or fish. Hence, Roundup ProBio is safe to everything except green plants. 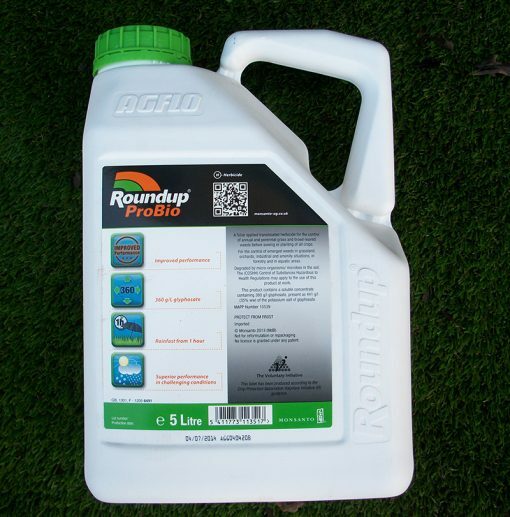 Roundup 360 is approved for use in areas open to the public and animals, or even near water!